The pinnacle of my relationship with my dogs is being able to take them off leash and walk with them anytime, anywhere. Being ABLE to do so is different from choosing to do so when it would not be in their best interest, but being able to do so is magic. Taking my dogs to a natural area and letting them run free has been one of the greatest relationship building activities I have ever had the pleasure of engaging in. We are doing different things in the same environment together. We each explore in our own way, and do different things within the environment that are meaningful for us. When I was a child, I was fortunate enough to live in an area where I had access to wilderness trails anytime I had time to explore them. I was also fortunate enough to have a dog to share those adventures with. I never went for a hike; I always described it as going exploring. We had fields and woods and swamps to explore and rarely did I encounter other people there. It was a peaceful oasis for me in an otherwise chaotic life. Thurber, my dog, would come with me and help me to break trail in the winter snow and find new places in the spring, summer and fall. Watching Thurber is part of what led me into the field of dog behaviour. She told me all sorts of things, just by her body language. I could always tell when people were around, by what she did. If she knew them, she would orient on them and wag her tail, low and slow and then run towards them when they got close. If she didn’t know them, she would orient on them but stand really still. By observing my dog, I got to see many more things out in the wild land that surrounded my home. She would tell me when other dogs were close by, when wildlife was near and when there was fire, all through her behaviour. When I grew up, I moved to Guelph and got a dog. We spent countless hours walking through the bush, often at night. A whole new world opened up to me. The woods in the dark is a beautiful and mysterious place and because I was accustomed to using my dog to signal what was around me, I could easily avoid things I didn’t want to engage with, such as teens out drinking or wild life. 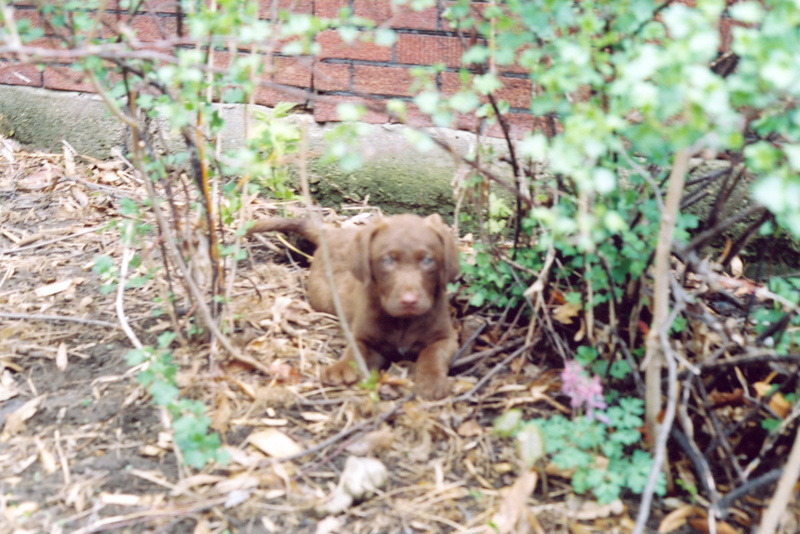 Over the years, I have shared hours and days and weeks of time out in the natural world with my dogs. By observing my dogs closely and preparing for the activities, I have been rewarded with breath taking events, great laughs and some sadness too. All of these activities have been enhanced by sharing my time and experiences with my dogs. When puppies are really young, the key to success is to get them off leash as early as possible. 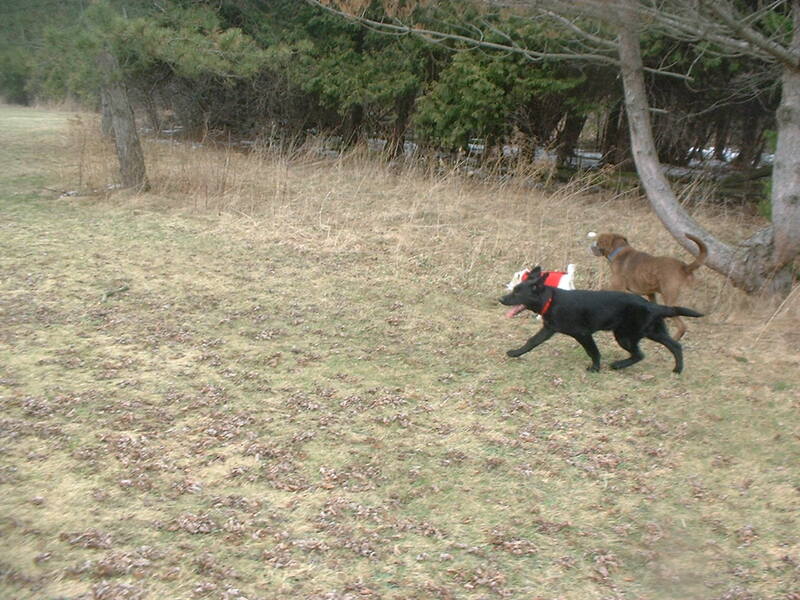 The first day home, I take my puppies out onto our farm and let them off leash. Young pups don’t tend to go far. If I have a breed of puppy who I think might be a problem, such as a terrier or a hound, I will put a light leash on the puppy to drag along for the first few times, but getting the puppies out of doors and off leash as soon as possible is a very high priority for me. I keep treats with me so that when the puppy comes bolting BACK to me, I have something to give him that he wants. Most pups want to keep the familiar person in sight at 8 weeks of age. At eight weeks of age, puppies aren’t able to get away from you; they don’t want to be alone, and they aren’t very fast. This is the right age to start off leash activities. I try and mix up the places I take my pups so that they are not always familiar with the terrain. This teaches them to look to me for information. The more new places I can go, the better in my opinion, but I have to keep a bunch of things in mind. I don’t want to run into other dogs, especially dogs I don’t know. That could expose my puppy to diseases I don’t want him to catch, or to behaviours I don’t want him to experience. I also don’t want to run into the stools of unknown dogs because I want to protect my young pup from worms. I don’t want to run into predators either. Hawks and owls can easily take a young small puppy. Coyotes, wolves and bears are also a concern in some parts of Canada. Even foxes can be a problem and will take a small dog if they stumble across it. Water can be another natural hazard to be aware of. About four years ago in Guelph, a young pup was playing on the ice and fell in and drowned. 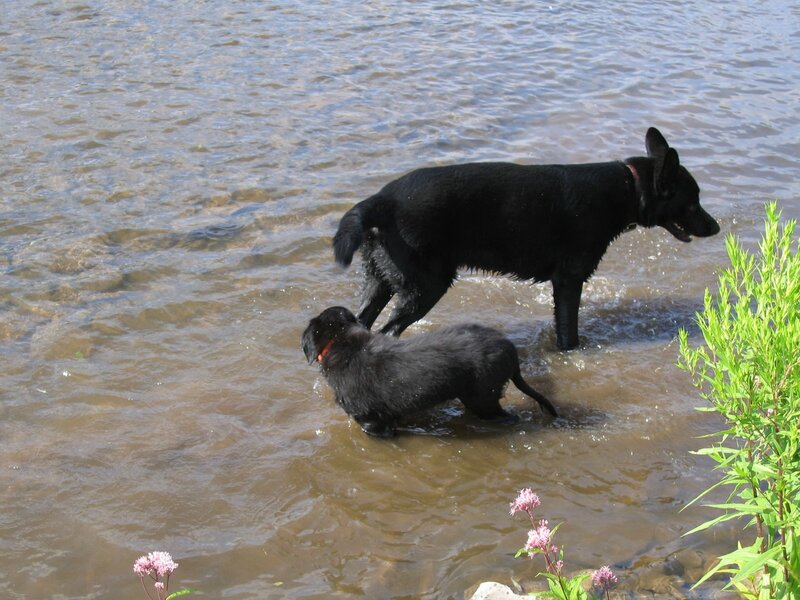 Fast water, deep water, ice and hidden water are all things I keep in mind when I am taking my puppies out for their first excursions into the natural world. Introducing puppies to water should be done in shallow safe areas where you can get in and help if they run into trouble. Ideally, pups should start to learn about water before they are 16 weeks old. As puppies get older, they start to get a little more independent, and we start seeing pups bolting at about 12 to 16 weeks. When this starts to happen, I quietly follow the puppies and step out of sight when they realize they cannot see me. Most puppies start looking for me right away, and that starts them on the road to a million dollar recall; they learn that their job is to keep an eye on me lest I disappear on them. I don’t want to frighten a pup, but I do want to make sure they know that if they are not paying attention to me, they may lose me. When they find me, I make a big deal about how clever they are and how much I value them finding me. I always bring treats with me so that I have something to give the puppy when he finds me. At about 16 weeks of age, I start bringing multiple dogs on walks with me. I use my older dogs to teach my youngsters that the aim of the game is to walk as a group and that although they are welcome to go and explore things or find surface water to cool off in or drink, they need to stick with the group. The older dogs are usually faster at coming back when called and the puppies learn to come quickly by following their older peers. I also start to leash up during the walks at this age. Half way through the walk, I will call, catch and treat the puppy, perhaps do a bit of training and then let him go back to exploring and playing. Whenever I am on the trail, even if I don’t intend to use my leash, I always have one with me and I always have collars on my dogs. If we are traveling through particularly dense bush, I also put a bear bell on my dog so that I can find him should he stray. I like to take adolescent dogs out in the company of older trained dogs to help them to learn important lessons such as coming when called. Around about 20 weeks, I can start to see something I call the recall sweet spot. This is the point at which the dog is still willing to come when called. If he gets out beyond the sweet spot, he is much harder to get to come back. The problem I see most often in my client sis that they allow the dog to range much too far away before they call them back and the dog is out of the sweet spot and into the danger zone. At this point, I will often stop going out in the bush and go to safe, enclosed sports fields instead, and work mostly on coming when called and lying down at a distance. The down at the distance is the brakes on my dog; if I don’t have a good set of brakes I don’t trust that my dog will stop if I need him to do so. If he bolts across a road, and a car is coming, I don’t want to trust that he will just stay on his side of the road; I train him to lie down and stay at a distance for his own safety. Working with my puppies off leash early and often allows me to do much more advanced work than I could do if I never let them off leash. There is an idea I keep coming across that says that the dog must earn the right to get off leash by proving himself to be trustworthy in his recall. This turns into a chicken and egg scenario; you cannot trust the dog off leash because he hasn’t earned it and he hasn’t earned it because you don’t trust him off leash. By taking advantage of the early time in his life when he is reliable about staying close by due to his developmental stage, then we can teach him what we want to do. I think also that this attitude of earning off leash privileges conveys an interesting attitude of distrust about our dogs; we are assuming that the dog wants to leave us. Very few dogs actually want to leave us. Some of them want to have more time to do their own thing or to explore but few dogs are actually invested in escaping. Most dogs like their people and like their life, and don’t want to be left behind. This is the goal. Adult dogs who are willing to stay with me, and explore the world around us. 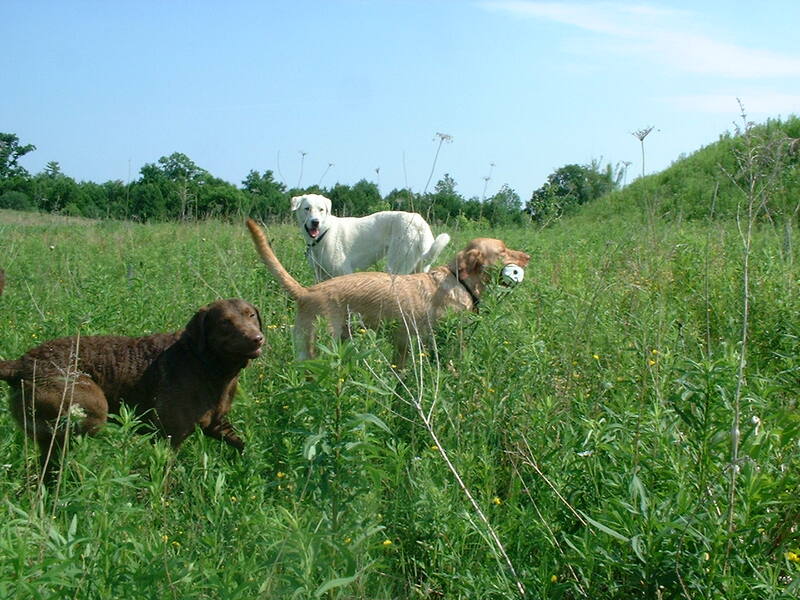 Off leash work is all about doing the similar things together and sharing the wonder of the natural world. As a closing note, I want to point out that when I take a dog out to enjoy the natural world, I do this with planning and intent. I don’t just go out and take off the leash and hope for the best. Even when I am hiking with friends, if I have a dog with me, there is always a small part of my attention devoted to where the dog is, at all times. I am always aware of my dog’s sweet spot, and what might happen if I allowed him to roam beyond the safe distance that I know he will readily come within. I always make it worth my dog’s while if I call him back to me; calling just to prove that I can is grandstanding and disrespectful. If my dog is engaged with something, I try and be aware of it and go and have a look for myself. This pays big dividends in many ways. As a child, I learned to use my dog’s behaviour as information, and honing that skill as an adult has allowed me to see turtles and snakes hatching, nests of ground dwelling birds and the droppings of a great horned owl. By following my dog’s lead in some of these exploration activities, I am able to connect with my dog on a deep and meaningful level. When I call, he assumes I will have something equally interesting to share with him, be that a treat, a chance to work, or the opportunity to see something that I notice and find interesting.